The stars finally seem aligned for rock’s instrumental flag bearer, the first chair saxophonist and one of the most consistent hitmakers in the field. For all of Paul Williams’s many accomplishments to date – the first to release a sax instrumental, first to score a hit with one and possessor of five national hits, plus two others by Wild Bill Moore which featured him in support – there has been a nagging sense that he happened to be somebody in the right place at the right time to take advantage of the changing market. You couldn’t call him an opportunist because he wasn’t jumping on a bandwagon already rolling, he was the guy who built the bandwagon that others subsequently jumped onto as he steered it through the wilderness. But you also couldn’t quite call Williams a visionary because he wasn’t radically re-inventing the wheel with his work, breaking new ground stylistically and demanding you stop in your tracks and listen, mouth agape, at what he was laying down. Instead Paul Williams was rock’s ultimate team player. A guy whose name you could write in the starting lineup knowing he’d give you solid, steady production day after day. He may never be destined for superstardom but would be a reliable presence on the scene for years, a hallmark of consistency. Yet here he was in 1949 riding the single biggest hit of the year, the biggest rock hit of the 1940’s for that matter and – to this day – the biggest rock instrumental record of all time! Could it be that we might’ve underestimated Paul Williams all along? That maybe, just maybe, Williams was more than just a valuable role player after all and was now ready to be crowned a king? If that was indeed his goal then this would likely be his make or break release. His momentum coming off the raging success of The Hucklebuck would never be higher. The public’s appetite for sax based rock instrumentals was still insatiable as we neared the midway point in 1949, as evidenced by the sheer number of hits in that realm still piling up. His record label, Savoy, had recently lost the services of his most potent “rival” for sax stardom, Big Jay McNeely, whose far more flamboyant style was in marked contrast to Williams’s more restrained approach, and so in order to ensure that they didn’t get raked over the coals for letting a potentially bigger star slip away Savoy would likely do all they could to promote Williams as the true ruler of the instrumental roost. By this point too Williams himself had to have acquired a firmer grasp on just what was selling, what was drawing the most rabid response from audiences and what was garnering the headlines and thus could focus on delivering just such a record to the masses. 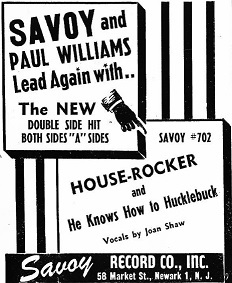 To that end they named this release House Rocker, an unambiguous declaration of intent that they hoped would silence all doubters as to Paul Williams’s claim to the throne. Cutting right to the chase… it did not. Though this was indeed a hit it’s obvious that people were going to buy whatever had his name on it following his mega-smash which was still selling like gangbusters across the country. They could’ve released a record of him ordering a sandwich at a deli and mumbling about the rising cost of cab fares and it’d probably have attracted enough curious fans to inch its way onto the charts. The real test, as always, is not how high it rises, but rather how long it keeps selling. House Rocker remained on those charts for just a lone week (at #12) which considering all it had going for it in terms of eager anticipation in the public for the next record by Williams, a title that was playing to the fan base in unambiguous terms and a record company determined to push all their chips to the center of the table when it came to promotion and distribution, means – if looked at from that perspective – this has to stand as one of the biggest disappointments commercially in rock’s brief two year lifespan to this point. But the commercial outcome only tells us how the public at the time reacted to the record and while generally speaking their failure to embrace a song – especially in the circumstances laid out above – indicates that it must not have been very appealing, there’s always the chance that it simply wasn’t what they were expecting. Perhaps the broader audience which turned The Hucklebuck into such a runaway hit included too many non-rock fans who weren’t going to be satiated by something more provincial by nature. So as we know by now you can’t simply dismiss something as failure without breaking it down to see if the music contained within had the right goal in mind and if it carried out its aims in the process. For the second time in this review… It did not. We’ll go out on a limb here and suggest that while Paul Williams wrote this he either didn’t name it or merely chose a name that had the potential to draw interest without fully grasping that to name something as declarative as House Rocker it actually to deliver on that promise. Unfortunately Williams does no such thing, turning in a performance that is more mild than tough, more demure than assertive and more ephemeral than captivating. It’s funny, oftentimes we’ll rail against someone who is too calculating in their attempts to hit every showy display that will draw attention, especially in the rock sax instrumental field. Those records tend to fail because they’re throwing every gimmick in they can think of without remembering to structure it properly so those gimmicks don’t sound gimmicky, but rather come across as genuine expressions of unbridled enthusiasm. Here the opposite is true. Williams actually DOES structure this carefully. Every musician is given a role and sticks to it. Each section of the record has a very definite purpose which they execute with a fair amount of precision. There’s a rhythmic groove that it holds throughout while not forgetting to provide a spotlight for the requisite solo. They aren’t trying to bowl you over clumsily like so many others have attempted, mistakenly equating noise with excitement, but instead these guys are following a carefully laid out game plan that shows they took this job seriously. Maybe most surprisingly they aren’t simply rehashing what they just scored with as too often is the case in rock ‘n’ roll, both at the time and in the years to come. House Rocker does indeed have a different vibe to it than The Hucklebuck and that alone is admirable and somewhat unexpected considering the nature of the record industry has always been to never stop trying to beat a dead horse into coming back to life and racing on as if it had never fallen. So the problem here isn’t the idea itself but rather in their embrace of a modest and unchallenging sound to carry out that idea. We’ve walked a tightrope with our critiques on Paul Williams thus far, making sure to give him plenty of credit for his groundbreaking status while at the same time insinuating that much of that was due to exquisite timing. We’ve patted him on the back for scoring a string of genuine hit records that were entirely necessary for the form, both the sax instrumental as well as rock itself, to take hold with the public, yet we’ve suggested that his more modest sound when compared to the raging sax honkers may have been responsible for that success because it wasn’t as polarizing by nature. In essence we’ve championed the ROLE Paul Williams has played in rock’s rise to power while downplaying the very records that’s gotten him to that lofty position even as we’ve felt somewhat guilty in doing so. However House Rocker does nothing but reinforce that assessment of Williams as the right man in the right place, a solid professional who excelled out of the spotlight more than in it. When he doesn’t have to shoulder the load, both on his own sides and backing others, he seems more comfortable with cutting loose and leaving his mark, yet when he’s asked to do so… and expected to do so, like here… often times he falls short, almost as if he’s afraid to be called ostentatious or something. Yet this particular house is built on a solid foundation theoretically, starting with a somewhat dramatic lead-in that effectively uses a stop-time progression which takes advantage of the pauses it creates to build anticipation for what’s to follow. You could easily see this set-up acting as a slow fuse to a major explosion when they all jump in, horns honking, drums crashing, piano pounding. The fact he’s lacking his old cohort Wild Bill Moore on tenor might seem like a detriment now that Moore has left Savoy for Modern Records, but he’s been replaced by TWO tenor saxes in Louis Barrett and Billy Mitchell, showing that all involved seemed to grasp the importance of that particular sound to put a song over. The rest of the group is different as well, as gone are T.J. Fowler, the pianist also on his own now, and the rhythm section of Herman Hopkins on bass and the steady underrated Reetham Mallett on drums are nowhere to be found. In fact the only familiar name on the session is Williams himself, but it’s not as if they brought in a trombone or a viola, they kept the instrument lineup the same other than beefing up the most important aspect with an extra tenor. So their thinking was hardly to blame for its shortcomings. For that we turn to the urgency of their playing, or rather the complete lack of any real urgency, as the pace never picks up enough to give any of them an opportunity to assert themselves. Neither tenor even gets a solo, nor does the piano, as instead they’re instructed to remain in tight formation throughout. You can see that they’re trying to score with what we’ve taken to call the “groove approach” of sax instrumentals, a hypnotic, repetitive churning rhythm that keeps you transfixed, but the problem is the one they choose is hardly addicting, just merely serviceable at best. That in turn leaves all of the heavy lifting for Williams, which as we’ve seen in the past was not always something he was comfortable with carrying. Sure enough he remains well out of the spotlight for the entire first minute which is taken up by the lurching ensemble. It’s pleasant in nature, but “pleasant” is only about the 792nd most desired adjective for describing a rock song, so it’s got too much ground to make up already. Williams finally enters the picture on baritone to handle the solo backed by handclaps which is the one part of this that works well even though it’s hardly invigorating enough to act as the focal point of the entire record. Once he steps back the others return to the same riff which hasn’t improved since the first time we’ve heard it and in fact, because now it’s lacking even the anticipation that it held the first run through, it comes across as a lethargic and somewhat timid compromise for them to take. We wait, expecting another solo from Williams in the hopes he can elevate his game but he never gets a chance as the others carry it to the finish line, rather abruptly ending things at a succinct two and a half minutes without ever trying to capture our interest more doggedly than that. You’re left thinking you missed something, but the only thing you’re missing are those two and a half minutes of your life which you won’t get back. They say water always finds its own level and with Williams we kind of suspected that this was it all along. Our impressions of him haven’t changed much whether he’s serving up something relatively uninspired or the occasional eye opener. He is what he always is, a man seemingly more content to be a reliable working musician than someone restlessly chasing fame and glory. When he achieved that fame and got that glory last time out there’s no sense that it went to his head, no sign that he changed his musical approach any to capitalize on it – save for the naming of his band as The Hucklebuckers – or even that he used its success to head back in the jazzier direction he’d come from and felt some pangs of resignation about leaving behind. Paul Williams took the accolades in stride, put his nose back to the grindstone and returned to the studio to cut more sides because it was his job. A job he took seriously and did well enough at every turn to remain a constant presence on the scene, yet one which – in the heady world of rock ‘n’ roll where wild eyed ambition is often worth more than consistent professionalism – was bound to frustrate us as much, or more, than he roused our passions. House Rocker therefore can be chalked up as another slight let down from Williams, or at the very least a missed opportunity in the commercial realm, but also in terms of forging a more lasting bond with those looking for emotional sustenance in the output of their heroes. It’s becoming painfully obvious that he just wasn’t going to do that no matter how much we held out hope. But rather than be aggrieved by his modest failings it might be smarter to simply accept the fact that in life it’s less often the creative trailblazers who advance a movement as much as it is the more accessible figures who provide an audience still uncertain of its validity with an easy to grasp entry point that gradually leads to mass acceptance. That’s where Williams made his greatest mark in the long run and if sometimes his releases don’t live up to our expectations it still can’t ever be forgotten how important his role was in establishing rock in the public’s consciousness. Lest ye forget that years down the road it was Paul Williams who was the one who was still on stage backing the biggest stars rock ‘n’ roll had to offer long after its overwhelming universal acceptance as a genre had been guaranteed by the hits like this, modest or not, that Williams churned out with regularity. 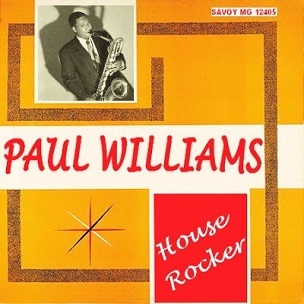 Leave a reply on "Paul Williams: “House Rocker”"